They may be from Alabama but they've been spending time in the Crescent City. 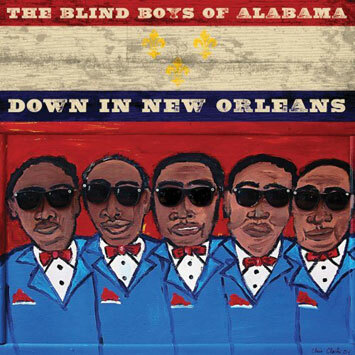 Four-time Grammy winners The Blind Boys of Alabama's new album 'Down In New Orleans,' their first in three years, will be released January 29, 2008 on the Time Life Music label. Recording for the first time in New Orleans, The Blind Boys are backed here by a trio of world-class New Orleans musicians: David Torkanowsky (piano), Roland Guerin (bass) and Shannon Powell (drums). Other guests include legendary pianist/producer and Rock & Roll Hall of Famer Allen Toussaint, The Preservation Hall Jazz Band, and the horn-heavy Hot 8 Brass Band, one of the city's most vital young acts. But the band's deeply soulful and natural voices remain in the spotlight on 'Down In Orleans.' After performing together for over six decades, The Blind Boys of Alabama have enjoyed one of the more striking comebacks in recent memory. Their last several albums have earned these hipster septuagenarians the best reviews and record sales of their career, four Grammy Awards in a four year span, and a completely new, contemporary audience.